When you are recommended the same place by four separate individuals, it is sensible to see what the fuss is about. When one of those individuals is a professional – and well-respected – food critic for a national newspaper, it would be bordering on the insane not to sample its wares. And so we found ourselves at Momofuku Noodle Bar on 1st Avenue, a teeming and intimate dimly lit ramen bar that seems to have become something of an institution since opening in 2003. This isn’t a restaurant review so I’ll skip over the finer details (empty water glasses were filled with swift proficiency, service was friendly, atmosphere was buzzy) and move onto the food. We’d been recommended the apparently famous steamed pork buns as well as the ramen – deep bowlfuls of tasty broth complete with pork shoulder, slow cooked belly, a poached egg and enough noodles for two people. Considering you can gorge on a near identical menu in Chinatown for around five dollars, the prices at Momofuku seem steep. In the region of ‘This had better be the best effing steamed bun and bowl of noodles I’ve ever tasted’ steep. And, OK. They were. 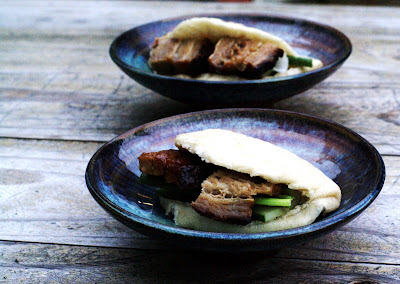 The buns are light, gently sweetened and filled with two slices of slow cooked pork belly complete with a slick of hoi-sin sauce. Fresh cucumber and spring onions cut through the richness. Whilst clearly Japanese in inspiration, the ramen noodles have been deliberately Westernized with the choice of meat: two cuts of pig that I’d happily have eaten entire platefuls of: rich porky flavours that can only arise from well sourced meat cooked long and slow. We walked home happy and sated, slept off the last of the jet lag and woke on Sunday feeling refreshed and ready to take on the City. Or, at least I did. The GF had other ideas which mainly involved feeling desperately ill for the next two days and being unable to leave the hotel room. Was it the noodles? Unlikely – I ate exactly the same menu and felt fine but when I mentioned the idea of re-creating that steaming bowl of deliciousness a couple of days ago she turned a worrying shade of green. Momofuku Steamed Buns with Pork. Brine a 400g piece of belly pork overnight (to make a brine, just dissolve 200g of salt and 200g of sugar in warm water. Let it cool before covering your belly with it). The next day, drain the meat and place in a roasting tray with 250ml of chicken stock. Cook in a warm oven (about 125 degrees C) for two hours. If the liquid dries up, just replace with a little more water. Towards the end of cooking crank up the heat to crisp up the skin. Keep an eye on it though because it can burn really quickly. For the buns, I adapted this recipe, courtesy of David Chang, chef/proprietor of Momofuku. Mix one and a half teaspoons of dried yeast with 250ml of warm water. Add a tablespoon of rendered pork fat. Mix well. In a food mixer, combine 90g of plain flour, 275g of white bread flour, a teaspoon of salt and 40g of caster sugar. Slowly pour in the water, yeast and fat mixture. Use a dough hook to knead it for about 15 minutes. It will be quite wet and sticky. 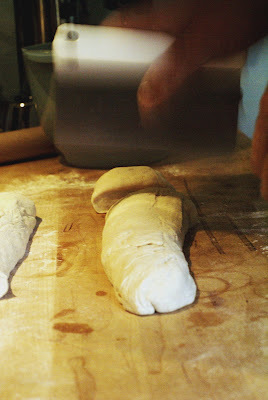 Transfer the dough to a lightly oiled bowl, cover with a damp tea towel and leave it to rise for a couple of hours. 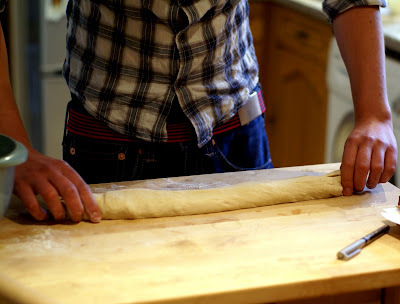 Once the dough has doubled in size, knock it back down and start rolling it into a long sausage shape. If it is too sticky, use a little more flour. Cut it into twelve even sized pieces and leave to rise for another forty minutes on a sheet of baking paper. In the mean time, cut out 12 squares of baking paper, each about four inches square. Slice the pork belly into thin pieces and leave to rest in the cooking liquid. They’ll mop up the flavours beautifully. Roll each ball of dough into an oval shape, about the size of your hand and fold it in half, placing it onto the square of baking paper. Again, leave them to rise for about thirty minutes. Set a bamboo steamer over a pan of boiling water and steam the buns for about eight minutes until they puff up. Once cooked, slice them open, spread a little hoi sin sauce over the bread, add some finely sliced cucumber and spring onion and then stuff them with as many slices of pork belly as you can. Eat these little pillows of deliciousness whilst they are still warm and another batch is steaming away. Satisfying and summery in the best possible way. Serve to hungry guests with bottles of cold, cold beer, preferably just as the sun is starting to dip down past the horizon. Great post! This brings me back to Momofuku (though I visited Ssam Bar, not the Noodle Bar). 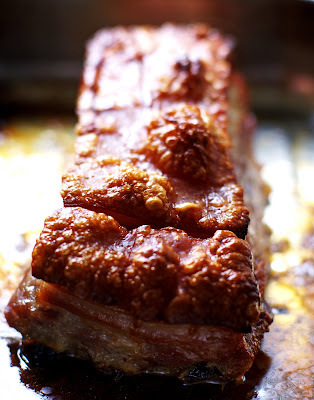 Were you able to achieve that tender pork belly texture - I always thought that perhaps it was cooked sous vide? Definitely going to try making this one day! Thanks! Lovin' your NYC series. One of my fav places in the world. Wish your girlfriend had her own blog. I'd def. be a fan! Timely, I just introduced myself to what's been called Chicago's answer to Momofuku last night- Urban Belly. Not the same price strategy though- a bowl of coconut saffron broth with bay scallops, small dumplings and rice noodles went for $12 and easily fed the two of us. Doesn't mean I'm not game to throw my own hat in, those buns look like fluffy bliss pillows if I've ever seen them. You - totally - rock! Su-Lin - The brining really helped, kept it very moist and incredibly tender. Not to mention tasty. Qgirl - Thank you. It is an amazing city. TKTC - That is a bargain! Slightly cheaper than Momofuku. Sounds delicious too. Cynthia - You're too kind! I've just made these for the boy. He loves all things Chineese and Japaneese, and I am never convinced (an intense dislike for ginger in savoury dishes is to blame I feel) and I can safely say they are absolutely bloody lovely. The boy also sends his thanks! Oh I love the bun .. this is easy and delicious , we dont eat pork so I guess beef or chicken would work too ! Zi - that's fantastic. So glad the recipe worked for you. Really good to hear. Room Design - chicken or beef would be just as good. Maybe with a touch of sweet chilli sauce. 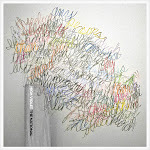 New York - Where to begin?